Add one to each of your apps. Self-promote your own titles or fill it with apps from other publishers. You know what your users want most. You are in control. Update at anytime without resubmitting a new binary. They found you once...now make it count. Let your existing users know about all your great apps. Announce new releases and promotions to engage with your users. Team with other publishers and cherry pick the apps your users would like most. You earn cash for every install you generate. Through our network of publishers, your app can be discovered by millions of new users. You decide how much you are willing to pay for real, organic installs. Active conversion funnel from apps viewed to installs, all in real time. See which apps and publishers are performing best. Just download our SDK and add 3 lines of code to your app. 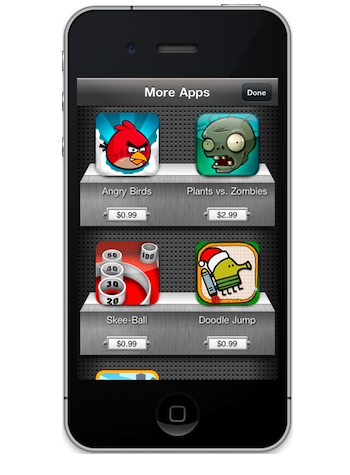 You have full control of your App Store through our website. Get going quickly by importing directly from iTunes. Choose from beautiful themes to match the look and feel of your app. Every app gets a product page with short summary, long descriptions, screenshots and videos! Sell globally with support for 18 languages. © 2019 AppExtras. All Rights Reserved.